When I was a kid, the best treat you could possibly be offered was a pick from a plate of Iced Vovos. The Iced Vovo is a confection completely native to Australia, and, as far as I’m aware, has never spread beyond these shores. 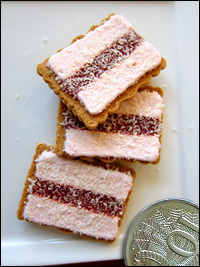 The Iced Vovo consists a biscuit crust overlaid with pink fondant1 which is bisected by a strip of raspberry jam. It is my memory that the Iced Vovo was a lot bigger when I was a kid, and has now sort of shrunk to a much less generous-sized item. I have asked numerous people about this, and everyone seems to be in agreement. It’s one of those things that’s rather hard to substantiate of course, there being no ancient Vovos still in existence. I do hold the fond hope that someone, somewhere in the 1960s thought to take a photograph of an Iced Vovo with a ruler for scale. Good Lord! Surely those are miniatures. Or do you have the power to enlarge 10 cent pieces? the special treat in New Zealand was a MallowPuff…..
Oh – I know them. They were covered in chocolate, right? Oh dear. You DO know you are at Tetherd Cow Ahead, right? Tetherd Cow Ahead is powered by	WordPress 4.2.23 and delivered to you in 0.368 seconds using 97 queries.